Snow battle set showing at Olympia alongside Hornby's 2013 line-up. 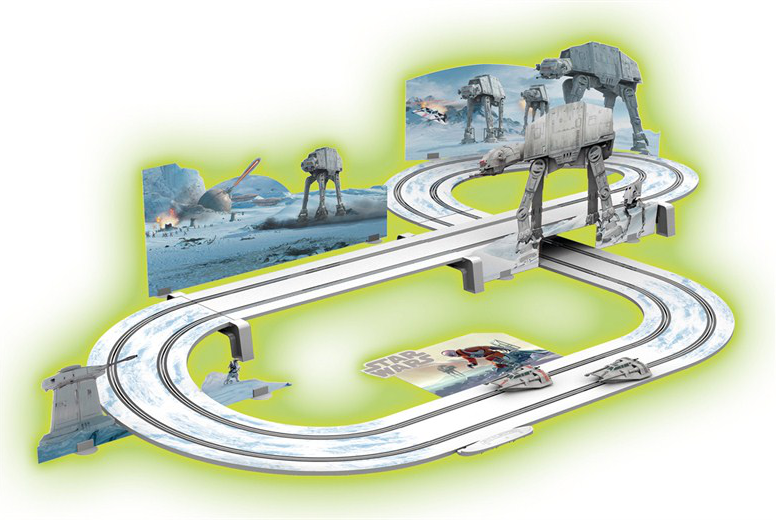 Hornby has made a snowy addition to its eye-catching Star Wars Scalextric range with a new Battle of Hoth set. The Battle of Hoth is the iconic opening scene of The Empire Strikes Back, in which Luke Skywalker takes on The Empire’s invading forces in Arctic conditions. The Scalextric - £99.99 RRP - features two snow speeders, cut-out scenery including artillery and AT-AT Walkers and the 500cm track has an ‘ice-bridge’ section. 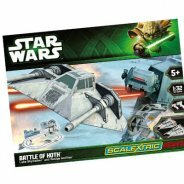 At last year’s Toy Fair Hornby announced it had signed a three-year licence to make Scalextric toys based on Star Wars. Also on the Hornby stand at Toy Fair will be another new introduction to Scalextric - Demolition Derby, which adds ‘build, race and destroy’ gameplay to the classic slot racing brand. In terms of trains Hornby will be showing The Majestic Train Set. With its £300 SRP, The Majestic incorporates the ‘revolutionary digital computer based control system’ RailMaster, which uses Hornby’s e-link unit that can operate up to 9,999 trains and in excess of 2,000 points or accessories.